Are you tired of hearing me complain about the weather? I know that I am, so instead here's something much more positive and helpful, written by the husband who chose to focus on three great things: perfume, books, and food. His recipe for pasta with fresh mozzarella and fresh fennel is wonderfully aromatic. I adore fennel in every form, and it reminds me of the best parts of summer. We have fennel in our back yard and it grows with a wild abandon. On the hottest days you can smell the leaves almost baking in the sun, wafting their anise-like aroma. Is it July yet? I’ve rediscovered Amouage Honour Man: a peppery, woodsy comfort scent that immediately conjures an image of a fireplace in a wood paneled library. Sophisticated, warm and cozy. Unlike many Amouage fragrances, Honour Man is not quite as big and Middle-Easterny opulent, but it's still enchanting with its woody smoothness. See Gaia’s full review. *Wife's note: he needs a full bottle. I’m reading “On Such a Full Sea” by Chang-Rea Lee and still trying to decide what to make of it. I loved Aloft, but this one is very different. It is hard to categorize and label. You could call it post-apocalyptic or futuristic and with a teenage heroine you’d immediately get a totally wrong impression on where this is going. It has an Asian sensibility and point of view that follows an enigmatic and rather passive girl through coincidental adventures in a future time Northeast while exploring issues of class, inequality, race/culture and social structures. It is a delicate and nuanced work but that somehow keeps you emotionally detached. Still an original story, style and voice that’s definitely worth reading. *Wife's note: I really need to read something that's not about the Kardashians. Pasta Telefono is a very simple construct. Take a basic tomato sauce and add diced fresh mozzarella to elevate the dish to a much more tasty, messy family fun. The fresh mozzarella melts and creates strings that give it the “telephone cord” name. My version adds fennel to the sauce, which brings sweetness and a herbal aspects. I also mix only part of the mozzarella with the sauce and the rest at plating. It keeps the cheese less gooey and messy. Still tasty though. In a large skillet saute the chopped fennel and jalapenos on medium heat until the fennel starts to brown and caramelize, 5-10 minutes. Add the white wine, tomatoes and spices and let the sauce cook for another 10 minutes on low heat. Add the cooked pasta and mix well. Add ½ of the mozzarella and mix well. Add the rest of the cheese when serving and garnish with a few fennel sprigs. That looks incredible! I just might have to go to the grocery store! Do you get those huge black and yellow caterpillars on your fennel plants that turn into Monarch butterflies? I tried growing fennel (eastern NC) and those caterpillars almost stripped the plants! Since they turned into Monarchs though, I didn't mind. I also love articles by your husband. He just reminds me of my late husband (almost 7 years now) who I still miss very much. He showed a genuine interest in anything I was interested in and he also did the cooking! Yes, we do get those caterpillars! The fennel is mightier than them, though, so I don't mind. And thank you for the comment and for reminding me how lucky I am. Sending you many hugs. I'm a huge fennel fan too! I'm going to have to try this. I only wish that the cats would let me have plants, so that I could smell it in our yard-less home. What a fantastic sounding recipe! Melted fresh mozzarella - I was sold at just that, but I also am totally in love with fennel (roasted fennel with parmesan or simple caramelized fennel are two of my absolute favorite things to eat in this world). I've tried to grow fennel in central NC, but although I didn't have a problem with caterpillars, I did to some extent with slugs, but mostly with our extremely loyal, friendly deer, who apparently failed to read the memo that fennel is supposed to be one of the aromatic plants that they don't care for. I've been told that deer are known to go ahead and eat deer resistant plants (which I've planted large numbers of), but then spit them out and so I've looked for evidence of that, but our deer are apparently far too polite to spit out anything on their dining table (aka my garden) and really do appear to simply be adventurous, "clean your plate" eaters. Oh, and another thing I liked about your recipe is the name - I get nostalgic sometimes for the days of telephone cords. Honour Man - great scent and loved the imagery you used. Need to find my decant for when the temperatures start to plummet again this week. Yum! 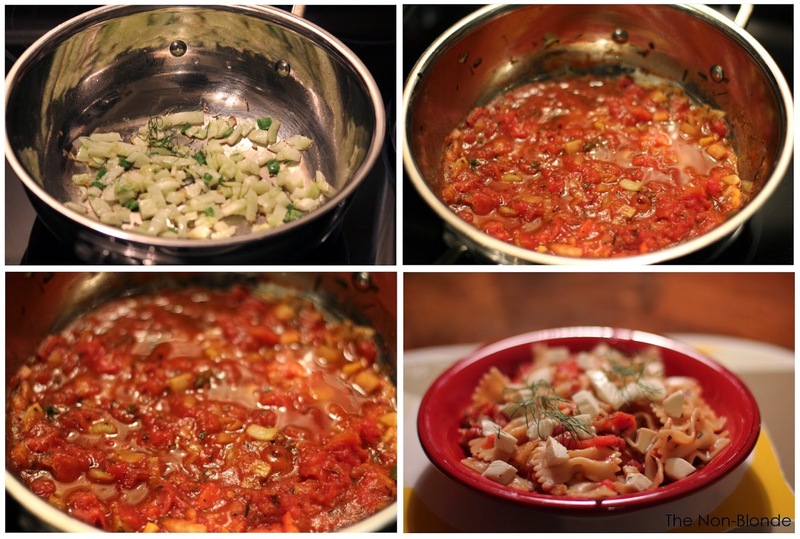 I've never thought of putting fennel in a tomato sauce before, but I don't know why not, since I love tomato and fennel soup. Thanks for the inspiration--the recipe sounds absolutely delicious. I'm also intrigued by your book review. I'm looking for something to new and interesting to read. Perhaps I'll try Aloft, since it sounds as tho you really enjoyed that one and I haven't read it.